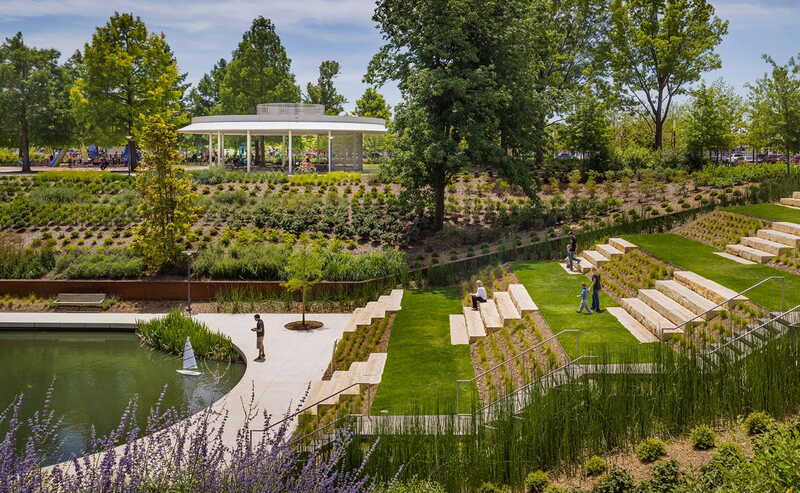 A daylong celebration marked the reopening of the renovated Myriad Botanical Gardens. Events included concerts, a farmer’s market and pumpkin patch, free admission to the Crystal Bridge, and a butterfly release. The 28,000 square foot gardens are located in the heart of downtown Oklahoma City. Frankfurt Short Bruza (FSB), an Oklahoma City-based architecture and engineering firm, served as lead architect and engineer for the building projects in association with Gensler during the yearlong renovations. The new design provides a community gathering space for arts, entertainment, culture and botanical education. The Great Lawn and Performance Pavilion now holds up to 2,500 visitors and will host events like concerts, outdoor movie screenings and seasonal festivals. The new Water Stage provides an incredible outdoor stage with theatre seating for 500. As part of the renovation, FSB marked their 65th anniversary with a $50,000 donation for the acquisition and placement of 65 trees in the Myriad Gardens. Each oak and cypress tree marks a year in business in Oklahoma City for FSB. The trees now line the Great Lawn and Performance Pavilion area of the gardens. A permanent plaque was dedicated to commemorate the donation.